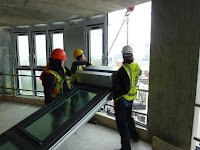 D&A Architectural, based in London, are involved with all types of structural glazing throughout the UK and carry out assessment of their employees to spot potential for career progression and recommendations for further training. Senior Project Manager of D&A, Catalin Bostan said, “We have regular rotations of workers who come to us on a temporary contract. Each employee is assessed and put forward for GQA Qualifications if they show potential”. D&A are committed to qualifying the workforce with GQA glazing qualifications at Level 2 and above. Recently, 41 employees at D&A Architectural have proven their potential and successfully completed their GQA Curtain Wall Installation Level 2. Catalin continues to say, “We have worked well with GQA Qualifications over the years to help strengthen and progress our workforce and will continue to do so in the future. We have already signed candidates up to continue to Level 3”. Catalin himself is GQA Qualified to Level 3 and is currently undergoing a Level 4 qualification through IVS Training and Assessment based in Stockport.